Kizoa is a well recognized name for online video editor tools and it is commonly used by most of beginners as well as professionals for development of attractive slide shows. Here you will get wide variety of animations, transitions and effects so that you can express your mood perfectly via videos. Users can access free account of Kizoa to enjoy basic editing needs with lots of impressive features whereas premium plans provide lots of advanced facilities. The easy personalization abilities make it one of the best choices for educators, business owners and learners. It provides best platform for development of tutorials as well as expressive videos. It is good to try with the basic account to learn the slideshow development process. It is much easier to customize most of the details like timing, duration, size and position details. Further, you can personalise animations as well as text tools. Users can get started immediately even without any registration process. Aspect ratio of videos can be also adjusted. The free Kizoa account has lots of interesting things to offer to professionals as well as beginners. The user interface appears little frustrating with confusing options. It offers limited features with cheap plans. Only Pro plan offers Full HD recording. 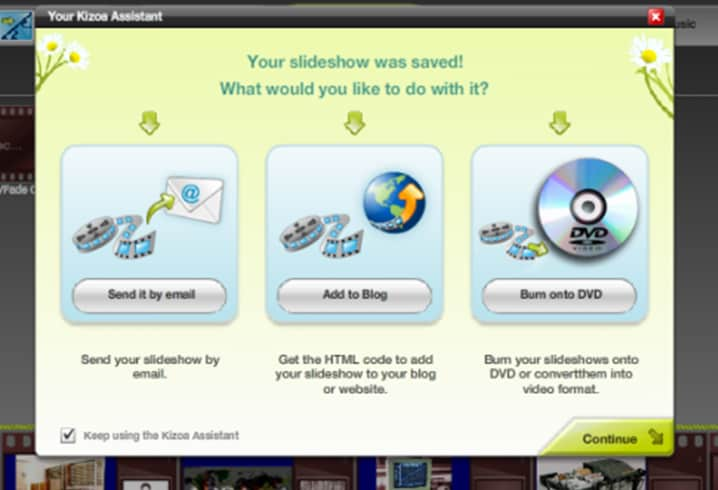 How to Make Photo Slide Show with Kizoa? First of all you need to create your personal account on Kizoa. Users can select any one out of Premium Pro, Premium DVD and Basic account as per need. If you are a beginner then basic account is recommended for easy learning. Once your account is ready then you need to upload desired photos into your account. These photos can be utilized for development of collage as well as videos. Users can make easy selection for what they want as an outcome. 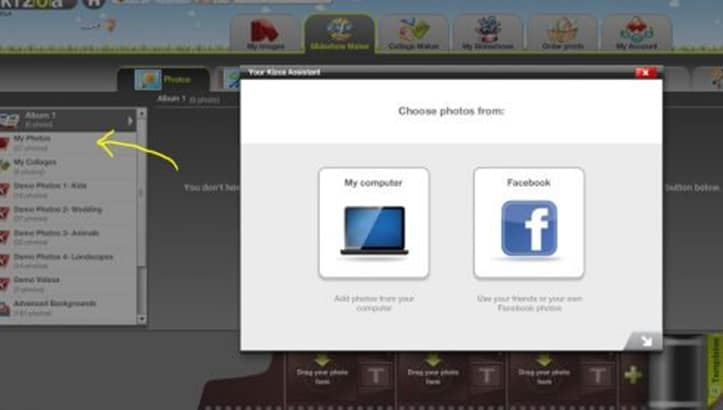 Once you enter inside the video section of Kizoa website, then you need to select pictures for development of your video file. Simply drag them from your computer and drop wherever you want to place them. Their order can be adjusted as per need. Next task is to add eye catching transitions into videos. When you are ready to add transitions then first of all you need to visit the transition tab that can be accessed from top portion of page. If you want to apply independent transition to every picture then you simply need to select the desired transition and then drag it to the right side box of respective image. It will soon come into effect. Now you can put text into your slides or videos. For this you need to select the text tab from upper portion of screen and then a big list of available text formats will appear. You can make selection for any of these as per requirement. Once selected then drag it to your picture where it is desired to appear. Soon a dialogue box will appear on screen that will ask you to put your words for current image. Add your info and the validate it with one click. It is possible to add music to slideshow directly from computer as well as you can make selection from huge collection of this website. Drag your desired file and put it over desired place where you wish to start it playing during video. Make required settings and then finalise it. Finally you need to preview your video and once found in order then simply save it with desired file format. It can be shared via email and users can also burn it to DVD directly. Kizoa offers lots of features for slide show development but as it can be used online only so you need quality internet connection to explore this platform. Hence it is good to search for few impressive alternatives to get your job done when you are offline. This advanced and feature rich platform assists users in development of entertaining photo slide shows along with appealing content. Every part of presentation can be easily customized whereas additional of classic transitions and effects make shows more eye catching. You need to follow simple three steps to get bets results: Organize first and then go for customization, finally create. This software tool completes design process in three simple steps: add, create and share/save. The effects, transitions and themes are interactive enough. It has about 450 background and attractive theme templates that can be accessed by users. More than 130 unique transition effects. Supports wide range of video file formats. This application cannot be used on phone. It is not possible to share resulting files on interactive CDs and users will not be able to send them via email too. Filmora Video Editor is a potential and classic alternative to Kizoa due to its incredible feature set and bright user interface. It offers dual editing modes and files with various file formats can be easily imported for development of interactive slide shows. 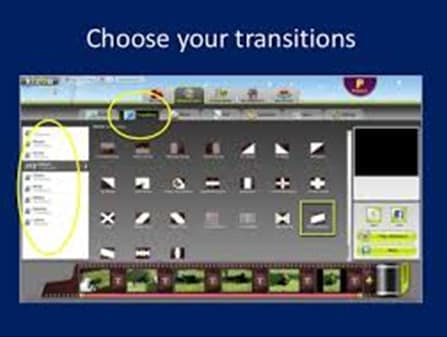 It is much easier to make adjustments on the basis of rotation, video effects like hue, saturation, contrast, brightness levels etc while incorporating advanced transitions and effects to every slide. 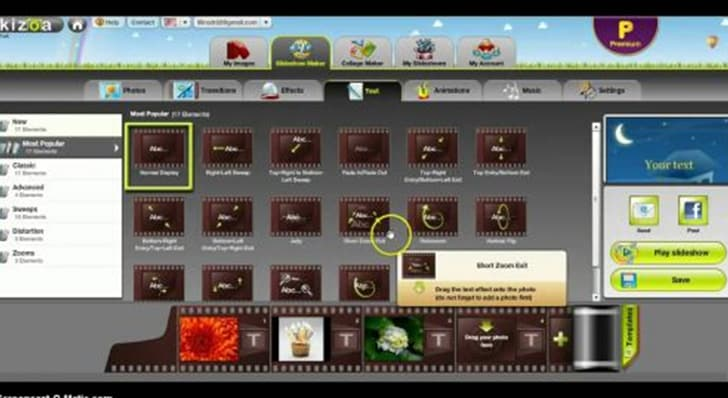 Beginners will find it much easier to add music, titles, photos, effects and videos into slides. Filmora Video Editor offers feature rich and easy to operate environment that suits to professionals as well as beginners. The intuitive user interface and simple design make it widely accepted tool for slideshow development. It offers wide range of transitions as well as text library with interesting collections. You will be able to apply stunning filters, advanced motion effects and interesting overlays to your presentations. It supports all major file formats. Files can be easily shared on social media platforms like YouTube and Facebook etc. It offers small range of preset templates. 3D effects cannot be added. Watermark is an annoying result of free version.